Pssssst. Did you hear??? Fiddlestick's is hosting the highly anticipated TEA Collection Sample Sale!!! What: Styles from previous seasons, one-of-a-kind samples, and current styles that have gotten estranged from its packaging. Sizes 0 – 8 years. Boys and girls. All samples will be sold for amazing low prices, from $10-$20! Bring your own bag and receive a $5 discount. And just between you & I...this event has been VERY well attended in the past. So this year we have increased the sheer volume of samples. 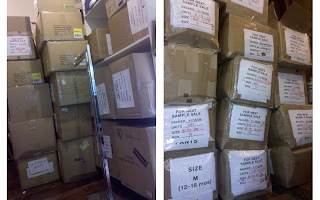 We are currently swimming in boxes and boxes and boxes of samples!!! This is NOT something to be missed. Back to unpacking...see you all soon!